As we’ve seen in the movies, museums come to life at night. That’s the case with the American Museum of Natural History, although, instead of the exhibits coming to life, the Museum is filled with curious teenagers attending Teen Science Cafés. This month we shine the spotlight on Leah Golubchick and her program in New York City. Because of its long-standing mission to bring science to the public, The American Museum of Natural History has connections with many scientists working at the cutting edge of their fields to share their work with teens and adults in an informal, fun way. I run the After School Program for teens at the museum, which includes After School classes, weekend workshops, school partnerships, and family events for teens. A big part of my job is making the museum a place where teens can learn about science that is not offered through schools and know that they can access such experiences here. Our Teen SciCafes program is a great addition because it complements our highly popular Adult SciCafes for 21+ audiences, and has allowed us to reach many more students who have never been to the museum before. 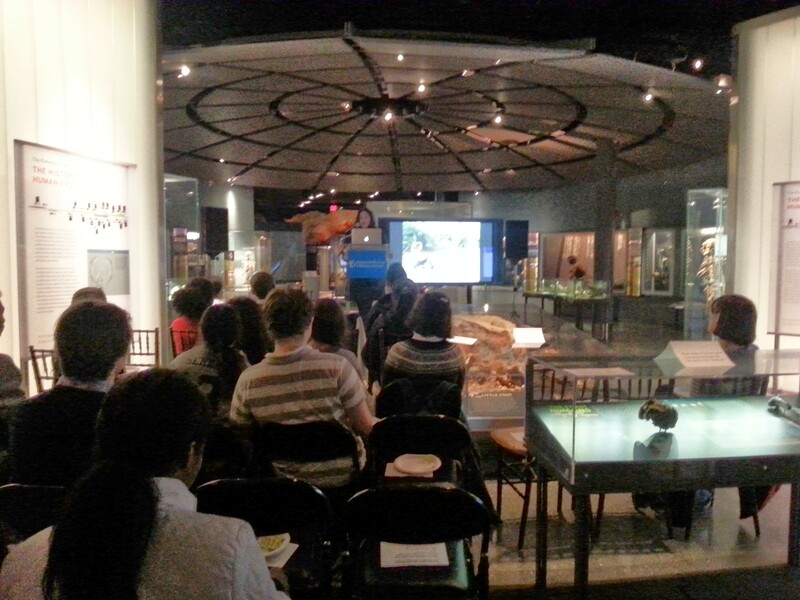 Your program has a home with the American Museum of Natural History . . . how do you see it fitting with their mission? AMNH is dedicated to discover, interpret, and disseminate knowledge about human cultures, the natural world, and the universe. 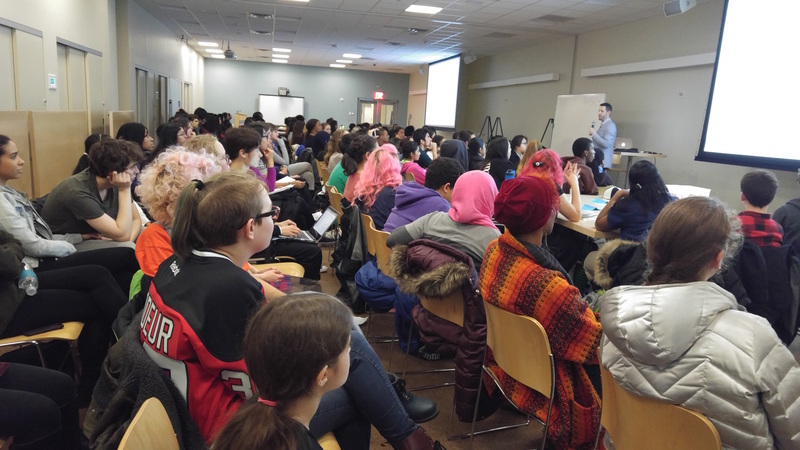 Teen SciCafe is a unique opportunity for teens to discover current research and for the museum to share new resources with teenagers across the city. One of the best things about working with AMNH is we can reach so many people across the city. Unfortunately, we’re still trying to figure out how to host large numbers of teens while still keeping Cafes informal, casual, and interactive with our speakers. Every cafe has been a new opportunity to try out new ways to connect. My favorite Cafe was Just Can’t Get Enough: Addiction and the Brain with Dr. Edmund Griffin. Dr. Griffin gave a very frank and interesting talk on why certain people—and some lab rats—get addicted to drugs. Teens really connected with his presentation and had some very informed and incisive questions for him after the talk. I also think its great to see how psychology and natural history can help teens make informed decisions about their health and well-being with real research about how our brains have evolved. The program is free, widely marketed, and intends to reach a really broad and diverse group of teens who are science-interested. The program allows such teens to find others like them, meet scientists, and get excited about current research. As a relatively new member of our program, what advice do you have to others in the Network who may be just starting their own Teen Cafés? My advice would be to reach out to other TSC programs as soon as you can! Its been great to hear what other museums are doing, to realize how much we learned over the last two years, and to rethink some of the ways we’ve been reaching teens. We’re always looking to experiment and try new ideas in our cafés, and its great to see what has been successful and also see what we’ve been doing that can contribute to the Teen Science Café community. Thank you for your time Leah! We look forward to following your café.